Gable-end conservatories are similar in construction to the Georgian style, of which modern gable-end conservatories are a variant. The front of the roof does not slope back to the centre but stands upright, like the end of a house, a feature which both adds style and maximises light coming into the room. The extended front of the gable-end conservatory not only gives the conservatory the illusion of extra space it is also frequently designed to look like the rising of the sun a feature from which comes the name the “sunburst effect”. 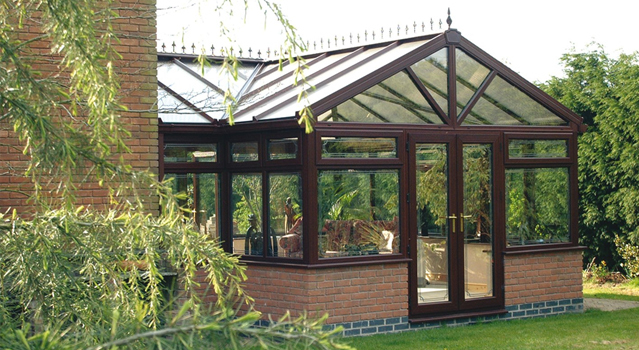 A gable-end conservatory generally has a square or rectangular shape footprint providing the optimum space. When it comes to the planning of the interior and to add that extra wall space a three-quarter or full-height wall can be utilised on one side to integrate the conservatory with the property.